When I first started researching Normandy for our trip, I came across Lonely Planet’s description of the area’s gastronomy: “Two ingredients sum up Norman cuisine: salted butter and soft cheese.” Umm, I’m sold. “You’ll often see dishes served à la norrmande in Normandy, which basically means they’ll be served with a sauce made with butter, cream or cheese (sometimes even a combination of all three).” Heaven! I was already excited to visit Normandy because of the area’s rich World War II history and it’s proximity to Mont Saint Michel, but mix in butter, cheese, and cream, and I was on cloud 9 before I even arrived! Is there anything better than butter? Maybe cheese. Is there anything better than cheese? Maybe butter. Worthy competitors, but when their powers combine…. On our trip, this combination usually took place in the form a pool of deliciousness for steamed mussels, that we scooped and slurped with the mussel shells, and then let our bread float around in until it reached the perfect state of sogginess…and then we devoured it. At the end of each meal, a completely emptied and cleaned bowl next to a bowl of empty shells were the only indications that food had ever been on our table. By the way, I think i pin-pointed my favorite shade of blue. It’s the ombre white to blue inside a mussel shell. S and my relationship is closely tied to mussels. We have a history with mussels. We often plan our future trips based on mussels. “Where should we go next?” “I don’t know. 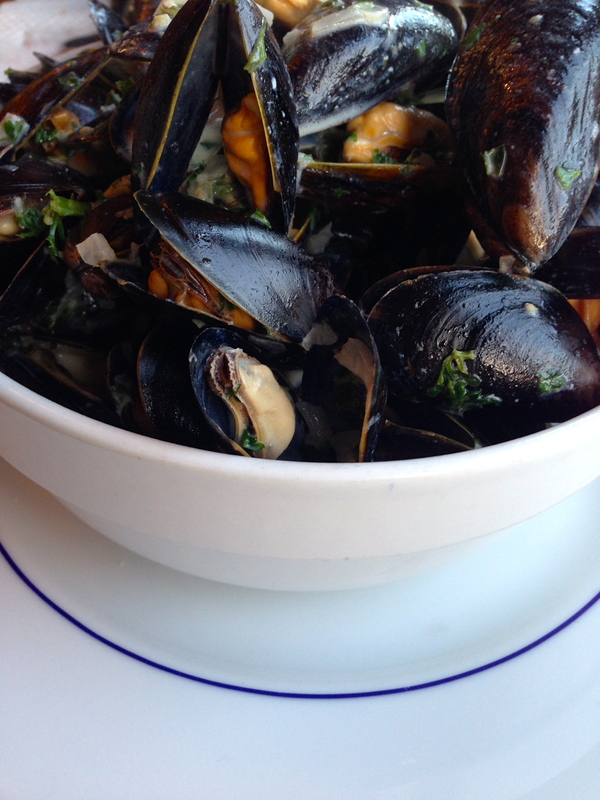 Where has the best mussels?” One of our all-time favorite restaurants is Granville Moore’s in DC. The interior is dark and lived-in. Exposed beams. Rustic wood tables. Van Morison and Crosby Stills and Nash-type play lists. Belgian beers galore. Every season, their menu showcases five types of sauces for their mussels. Most recently, we had a spicy pumpkin curry that was to-die-for. And we can’t forget their array of mayos for the Belgian-style fries. It wasn’t our first date spot, but it was definitely a repeat date spot. One time, we even ate dinner there with a plastic cup holding two swimming goldfish perched on our table. We had won them at the bar across the street while we were waiting for our table. S named his Clarence and I named mine Sandy. We’re pretty sure that Clarence killed Sandy and then after about six months, Clarence accidentally swam up into the filter. That was a dark time for S. Don’t tell him I told you this story. 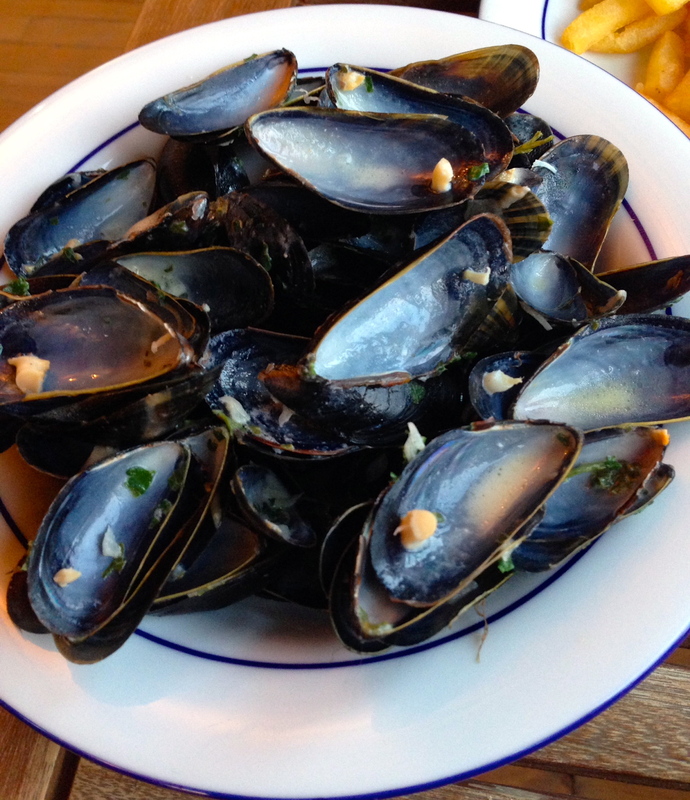 Anyway, we’ve never had mussels to rival Granville’s (not even in Bruges, although they were pretty fantastic). (We also haven’t had any goldfish.) 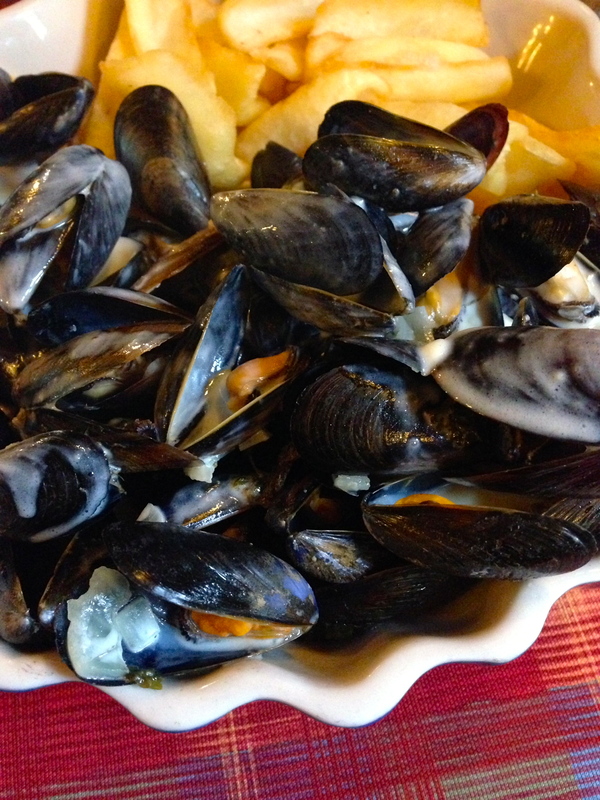 Nevertheless, Normandy’s mussels are a close second for us. We tried the freshly caught mussels à la crème twice at our hotel’s restaurant. I’m not even embarrassed to say that twice we requested extra bread just so we could soak up and enjoy the cream that remained after we had slurped down the last of the mussels. Actually, one time we teetered on the extra bread and our waitress insisted that we needed it. Respect. We tried them à la crème again in Bayeux and again on Mont Saint Michel. Then in Etretat, we tried them in a Roquefort sauce. Blew our minds. Still not better than Granville’s, but we’ve come to accept that there’s a good chance that nothing ever will be. For us, this fact is not cause for despair. We are willing to search the world for a challenger and are comforted, made hopeful, and always hungry knowing that Granville’s exists. I know, we’re veritable crusaders, aren’t we? 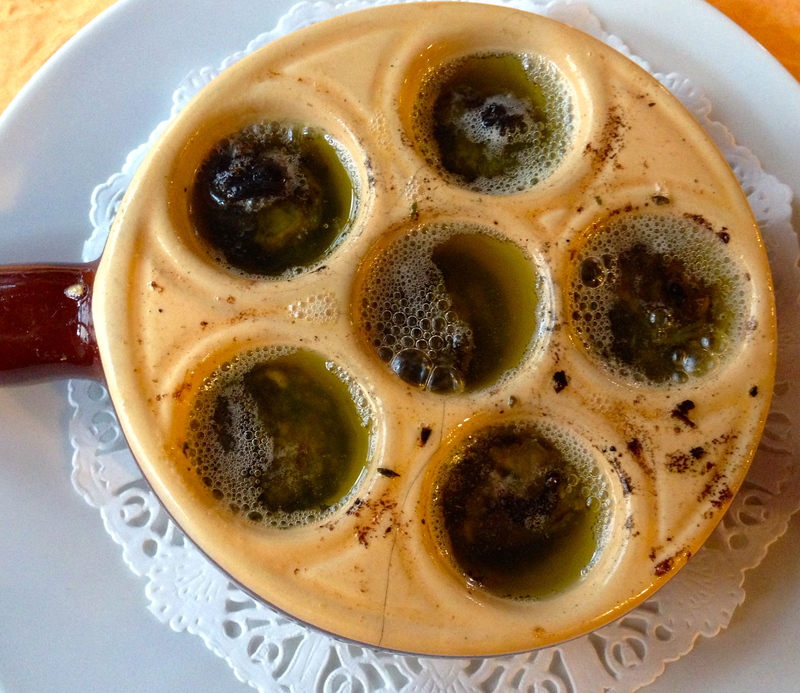 When we weren’t eating mussels (or just before we ate mussels), we had some fabulously garlicky escargot. 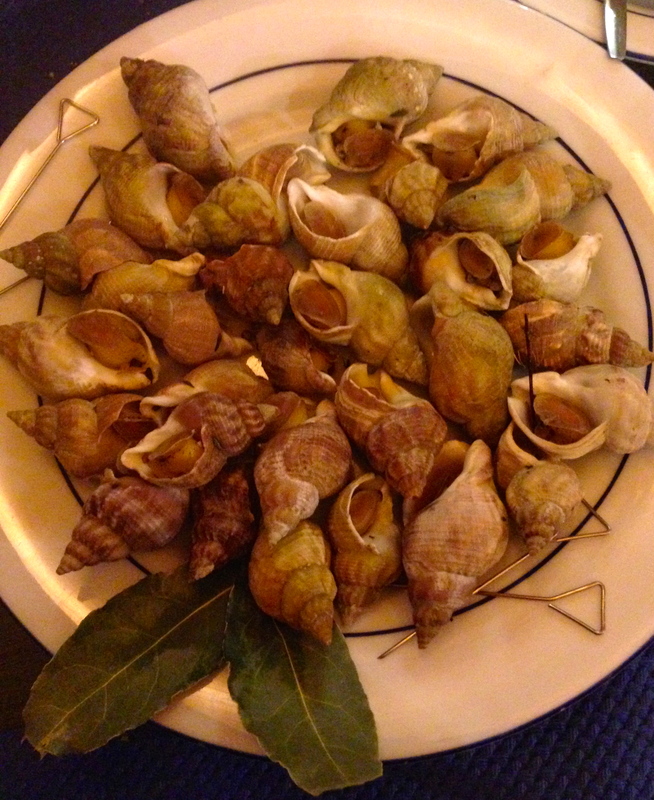 We also discovered a new love for whelks. It was something about the fun involved. The game. The artistry. You have to stick a pin in the shell, catch hold of the whelk, and then slowly pull it out so as not to break off the tail and loose it in the twisty shell forever. Then – this is the best part – you plunge the chewy, noodley mollusks into the flavored mayo of your choice. The texture and taste is new and delicious. The fun of a meal where you are forced to take your time, enjoy your date, savor each bite, and savor the conversation, is unbeatable. Follow this with mussels and some Norman cider and you have yourself a great night. The cider. It’s my new favorite not-quite-wine, not-quite-a-beer drink. And Normandy does it to perfection. On several occasions, our hosts also convinced us to indulge in a little Calvados at the end of the meal. At the risk of seeming impolite, we accepted. And it was awesome. The locals say that the two secret weapons of the French Resistance during World War II were French women and Calvados. I believe it. Whew! Both are really strong. I can’t even talk to you about the desserts. For two reasons. One, I ate them so fast it’s hard to remember exactly what they were, and, two, it will make me crave one and, after this trip, I need a bit of a cream and sugar detox…. Nice! 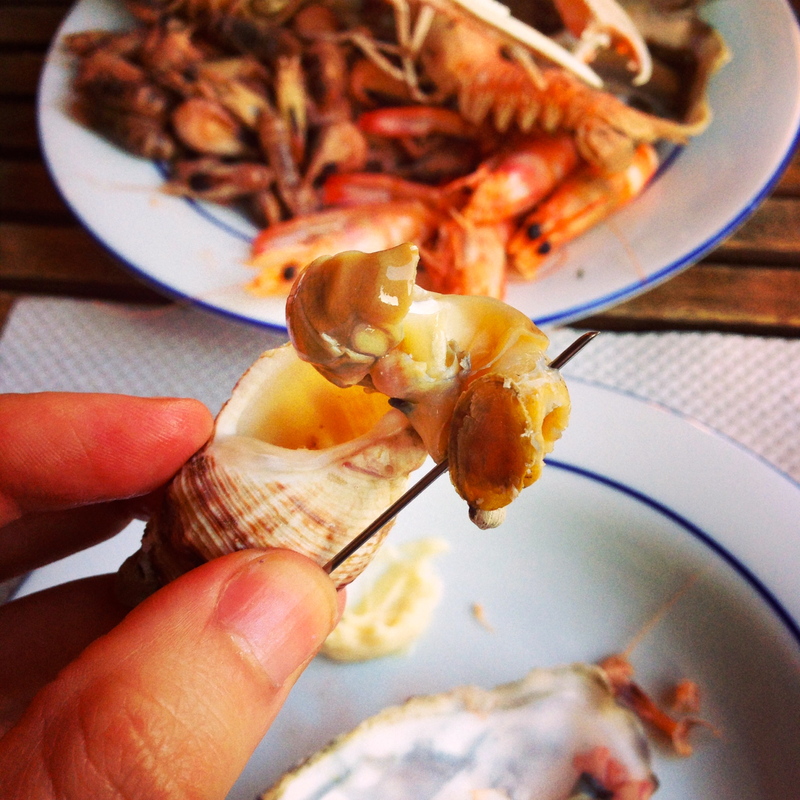 I visited Normandy last autumn and enjoyed the same and similar food! Cheers. Thank you, Kamila! I’m glad you enjoyed the region’s food as much as I did!